Interesting name for a pen given Icarus's fate. Thankfully, I don't see this particular model burning up in flames: the construction and materials involved seem to be bomb proof, and the filling system is simple yet convenient. I have no concerns about throwing the pen in a bag and heading to class. The hourglass section and general ergonomics also deserve special mention as this is quite a comfortable pen to use! The construction, while quite hardy, is a little rough in spots, which is quite acceptable for a hand-made pen at this price point: the threads might have some not-quite-cut material in them and the feed will require a toothbrush scrub to get material left over from machining out of the fins. Overall: practical, flexible, quite comfortable to use, a minimalist aesthetic that doesn't draw undue attention, a little rough around the edges, and quite affordable. In other words, the anti Mont-Blanc (which is high praise in my mind)! 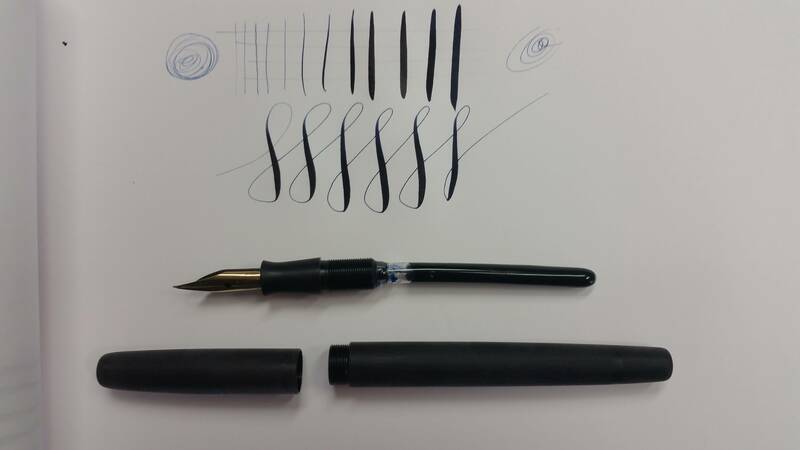 I've often seen the Ahab, and Noodler's pens in general, labeled as "a pen designed to be experimented with" (a phrase that, to me, simply is an excuse for a pen that cannot write decently out of the box). In my mind the Desiderata pens are the ones experimenters should be going for; not only do you get a pen that works well out of the box but you get a great platform for trying various feeds and nibs. I've currently settled on a vintage nib to use with this pen that I find delivers excellent results. 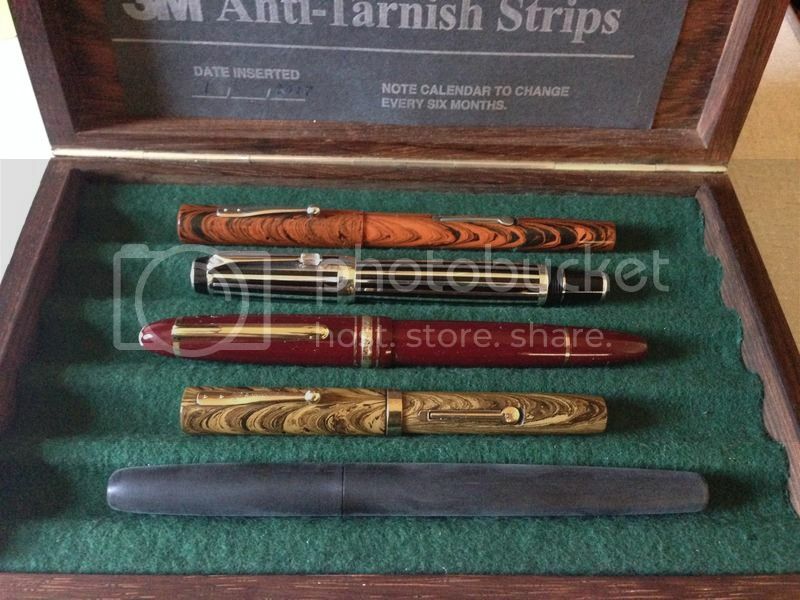 Hopefully it may inspire others to see the value and potential in the Desiderata pens. The pen is a bit blunt and less attracting than the Deadalus. Yes the ebonite version looks quite lovely, though I'd probably prefer the version I got since I don't have to fret about its durability near as much as I would an ebonite version. Hah that's an interesting perspective; I'd consider this pen the more appealing of the two, as well as leagues more ergonomic. I insist on only keeping 5 pens because I think we all know where it can lead. As you can see, it is gone. The Icarus' writing thoroughly embarrasses every pen in my box including one very wet-noodle & a 1 mm crisp, cursive italic made by one of the great nibmeisters. Edited by Bordeaux146, 14 April 2017 - 22:48. I'm sorry to hear that. I don't know what happened. I sent a notification email on February 15 to keep an eye out for it by the end of the month. I have one of the prototype Daedlaus pens. And then last week I got to try someone's Icarus (Zebra G nib). And it was *quite* lovely to write with -- although I gather the owner had the same issues with the original nib as I did with the Zebra G nib on my Daedalus. The Icarus pen itself was quite nice as well -- a good size and balance for me. The chrome Zebra-G nib will corrode overnight so don't leave it in the pen. Treat the Desiderata like a paint brush and wash it after you're done using it. I at least pull the nib and store it vertical (nib end up) with the cap on. The Tin (gold) Zebra-G nib will not rust so quickly but I'm not sure how long you could leave it in the pen without damage. The nibs are $1 to $1.50 each so order a box of 10 and toss them when they aren't working perfectly.